You’ll notice in the recipes coming out this month that I’ve been experimenting a bit with oat flour. You can buy oat flour in both regular or gluten-free versions and the benefits are the amount of fiber and protein in comparison to traditional flour. Traditional all-purpose flour only has 4 grams of protein and less than 1 gram per 1/3 cup serving where the oat flour has 7 grams of protein and 4 grams of fiber! 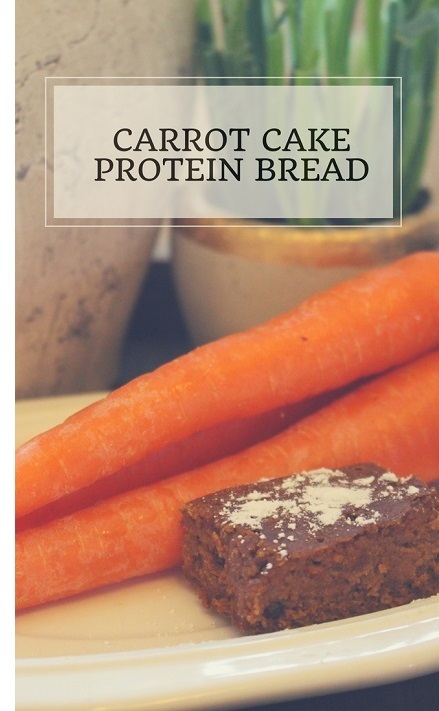 Adding the protein powder not only adds to the protein and fiber aspect of the recipe but also gives it a yummy vanilla flavor. Protein and fiber may help with weight loss helping keep you full for a longer period of time as well as may help with blood sugar control as it aids in slowing down the digestion of carbohydrates! Enjoy! Mix flour, CardioWhey, cinnamon, allspice, nutmeg, baking soda and salt together in a bowl. In a separate bowl mix egg whites, sweetener, carrots, and water/milk. Let cool and cut into 12 squares.